According to researchers who recently published a study in the Canadian Medical Journal, there may be a connection between pregnancy hypertension and end stage renal disease (ESRD). The study focused on hypertension disorders during pregnancy and a possible association between those disorders and ESRD. Insurance claims dated 1998 to 2009 were used for the study. In all, more than 26,000 claims were filed by women between 19 and 40 years of age. These women had experienced pregnancy hypertension with no health history of diabetes, hypertension, lupus or kidney disease. Researchers chose an additional 214,000 women as controls. 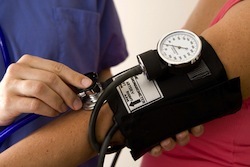 None of the controls experienced hypertension disorders during pregnancy. The group of women who experienced hypertensive disorders during pregnancy was at increased risk for kidney disease and ESRD, even when other factors like age and year of pregnancy were taken into consideration. Researchers also narrowed down the women based on coronary artery disease, urban status, congestive heart failure, abruption and hyperlipidemia and increased risk still existed. Women who experience hypertension or hypertensive disorders during pregnancy are more likely to suffer kidney disease and/or ESRD. The highest risk occurs in women diagnosed with eclampsia or preeclampsia. Source: I-Kuan Wang, Chih-Hsin Muo, Yi-Chih Chang, JChih-Chia Liang, Chiz-Tzung Chang, Shih-Yi Lin, Tzung-Hai Yen, Feng-Rong Chuang, Pei-Chun Chen, Chiu-Ching Huang, Chi-Pang Wen, Fung-Chang Sung, Donald E. Morisky. Association between hypertensive disorders during pregnancy and end stage renal disease: a population-based study. CMAJ January 21, 2013 First published January 21, 2013, doi: 10.1503/cmaj.120230.